Rachael Ray's Nutrish: More thoughts about dog food. For the second time in as many days someone who ought to know better has mentioned the new "Nutrish" line of dog food endorsed by Rachael Ray. Both of these reports have been glowing recommendations about the quality of the product. The first person received a free sample and reported that her dog "LOVED" it. 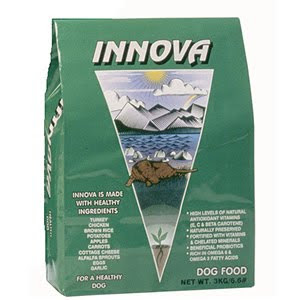 Well it's basically coated with "Animal Fat" of course your dog likes it. The second person bought the food because she LOVES Rachael Ray and "Rach"** is someone who really cares about nutrition so the food MUST be good food. It doesn't help that Nutrish is also labeled as a "premium" dog food. ** Seriously, you're on a first name basis with television personality "Rach"? Back to the food though - I looked at the ingredients, which are hard to find buried on the Nutrish website. The first ingredient is indeed Chicken, fair enough. The problem is that ingredients on labels are listed by weight - Chicken contains a lot of water, chicken meal doesn't contain as much - so while chicken might be the first ingredient by weight there's a good chance that the Chicken actually has had water added and there's not likely to be a lot of it by volume. After the chicken there are fillers, fillers and fillers in the form of rice, Corn meal and soybean meal. Yummmm Soybean! Delish! When you consider that most goldens (and a lot of dogs of all breeds) have some degree of corn sensitivities (or allergies) that's a lot of corn to put into a dog food. Then when you consider the low digestibility of corn and corn products, there really isn't a justifiable reason to add corn (meal or gluten) to dog food unless to augment volume (filler). Next in the list is "animal fat". That's right, some kind of animal, some kind of fat. They don't have to list the source if they call it "animal fat". It could be opossum fat, monkey fat - just animal fat. Yummy. Now in the grand scheme of things "Animal Fat" is likely to be rendered from beef, pork, lamb and/or poultry sources - but wouldn't you like to know what you're feeding your dog? What if you have a dog with an allergy to beef? Will one batch use chicken fat? Next the mineral pack including calcium phosphate and salt, then a few ingredients down the list there are some vegetables: peas, tomatoes, carrots, etc - but read that again there is more SALT in this food by weight than vegetables. Again, no wonder your dog liked the food - it's salt and fat. It's a veritable canine Big Mac! Look, junk food isn't all bad. Everyone loves a french fry from time to time - and our dogs like to eat junk food too. There's nothing wrong with junk food in moderation. But you can't feed your toddler McNuggets exclusively, there's got to be balance. The same concept holds through for our dogs - make decisions on the quality and quantity of the ingredients, not based on the face on the bag or the gloss of the ads promoting the food. I know that some of the proceeds of Nutrish sales are donated to dog related charities (rescues). That's great and it's a noble thought - but - if you want to do right by your dog AND help other dogs in shelters (or rescues) there's a much easier way to do it: Feed your dog a food brand without all the garbage fillers, you'll feed less and you'll have a healthier dog. Then write a check for a monthly contribution to a local all-breed rescue or your neighborhood humane society. Teller and I didn't get into the trial this weekend - or the trial the weekend after that (or the one after that). There are a lot of trial options this winter - and I presume even more again next year, but it's still hard to get into 330 run trials in southern NH - lots of agility folks live and train down there - which makes it very easy for them to trial on weekends - even if that's every weekend. It's only a 3 hour drive for us, but it's still a hotel stay and there's nothing easy about it. Both trials closed around that New Years trial with the snow and awful driving to get from the hotel to the trial, the long and technical drive home that Sunday night and the brutal cold that followed the snow - so I was somewhat relieved that I wouldn't have to drive in weather or forfeit entries. I'm still not convinced that I really want to trial during a New England winter - for one it's cold and the weather can be anything and on the other side of the coin I really can't afford to be out trialling every weekend - or even every other weekend. I have to admit that I'm jealous of the folks out there with sponsors, those that trial as a business expense and those that trial and train as their primary focus...Knowing that I don't fit into any of those groups its not always a bad thing to be the one left at home, but there's always a certain amount of pining for the option when the rest of the crew all packs up and goes to play for the weekend. On another note, we're still working our a-frame contacts. I'm still having a hard time getting him to do "one hit" in training - So far he's blown his a-frame contact only one time in training on the 50 or so reps that we've had since the last trial - I don't think we've fixed the issue by any stretch of the imagination, but I'm hoping more time and more reps will help. I guess we'll have to wait until the end of February to know for sure. Ask ten dog owners what they feed their dogs and why (even folks well versed in canine nutrition) and you're likely to get ten very diverse, very opinionated and very emotional responses. Some of these same people feed their children McDonald's chicken nuggets several times a week but are careful to feed their dogs only organic raw - the disparity is not lost on me. I too am guilty of very carefully considering my dogs' diet and then happily tossing them gobs of cheap oscar mayer hot dogs...As an aside Teller is very fond of the cheese filled hot dogs - I only buy them for trials but they are just about the highest value treat we've found yet. Over the last few years, I've done rotations of commercially prepared raw food (Oma's and Bravo). I briefly (emphasis on the briefly) ground my own raw food, I've cooked stews (one version for Teller and one version for Murphy) carefully packaging and freezing a month's worth of dog food at a time. As good as I felt about knowing exactly what my dogs were eating, there had to be a balance between spending entire Sunday afternoons cooking for my dogs while toting Lean Cuisine frozen meals for my own workday lunches (and dinners many nights). In between these rotations I've gone back to various brands of kibble. Rotating both protein sources and manufacturers - hoping to balance nutrient packs and the effects of any one nutrient pack over time. I've dodged some of the scary pitfalls of the dog food scares - melamine, salmonella, aflatoxins, etc. I won't feed foods with corn - period. I avoid rice if possible. I've tried various versions of grain-free foods with limited success. I've reached the point where I just can't feel good about feeding my dogs kibble - of any brand. I do like some of the dehydrated foods on the market now though. No corn and no fillers - again easy with commercially prepared raw diets. Easily digestible both from a nutrient standpoint but also on the output side of the equation. Availability of novel protein sources - and even better single protein source foods. Thankfully this is easy when choosing a commercial raw product - nearly all of them are single protein (exceptions are the Primal mixes that do adulterate proteins). Portability. Its hard to travel with multiple coolers - one for raw food and the other for cooked bait, soda, yogurt, etc. I have not found tupperware yet that will truly stay water-tight in a cooler filled with ice. My compromise is to buy raw in sizes that are one meal. A one pound factory-sealed, leak-proof 'brick' of raw will feed my two one meal. It costs more but it's convenience. Both dogs need to be able to eat the same thing. I don't want to have 3 or 4 kinds of foods around here at any given time. Teller as an intact and active young lad needs significantly more calories than Murphy does while working his best impression of a couch potato. Back when I fed kibble, both Murphy and Teller had trouble with the Innova Evo line. Murphy was itchy on both versions of EVO (regular and red meat). Teller did really well on the standard Innova kibble, but Murphy had to be cut back to less than a cup of kibble a day - which does not make for a happy Murphy. Our last rotation has been Honest Kitchen's Keen with the addition of extras like raw or cooked chicken breast, raw or cooked eggs and steamed veggies. One of the least objectionable kibbles available locally used to be the Eagle Holistic line - Eagle Pack tends to be digestible for most dogs. I can't recommend the Eagle Pack foods following the corporate change with both Wellness and Eagle Pack falling under the new Berwind/WellPet Industries. Bigger is not better and as a consumer bigger makes me worry about quality control and quality oversight. I just don't feel comfortable recommending it anymore. The Honest Kitchen foods have been a godsend for Teller - he's finally holding his weight more consistently on the dehydrated raw food. Honest Kitchen travels well and smells wonderful. The ingredients are sourced in the US and I feel like I can trust the company. I don't like some of the messages that Honest Kitchen puts out there around the touchy-feely concepts of "Pet Guardianship" and "Pet Parents" (not getting into that slippery slope here) but they produce a quality product. Ingredient for ingredient it's not that different than a premium kibble but the source is a known quantity and batches are small. What is not small is the price tag - another part of the balancing game. Several agility venues allow 24" weave pole spacing - though we haven't seen a lot of them in competition - until the last 6 months or so and now that seems to be all we're seeing. We've been working with 20" weaves at Waggles and Teller seems to "swim" a bit in the 24" weaves in trial. I really wanted to get him some good reinforcement and some training time in the 24" weaves - so...we bought some 24" weaves. They arrived on Wednesday and once I purchased the correct size bolts for the weave cups (that arrived with the wrong size) I was able to try them out last night. Of the two of my dogs it was Murphy (who has never seen 24" poles) who adapted immediately. Teller thought about it a little though it was nice to see him start extending in the larger spacing. We started the new year off with an agility trial. It felt good to get out and work after a long holiday break. The weather was - well "New England in Winter". There were early predictions of a nor'easter that never materialized...and when I left Friday morning (earlier than I needed to) the roads were OK. Some parts of the interstate were heavily hard-panned, but mostly open and wet. Friday was Excellent-only so we went down for JWW - and came out with a Q. What an awesome way to start off the year. That's MXJ leg #3. Saturday morning I woke up earlier than I had intended to (I never sleep well at hotels) and it was good that I did. There was 3-4" of snow on the ground and the hotel was about 25 miles from the show site. As it was it took us about an hour to get there and the roads were not good at all. We started the day with FAST and had a scary moment when Teller crossed in front of me, I stepped on him and we both went down hard. The replay on video is awful - how neither of us broke something I don't know (and the clip did not make the highlight reel). It was horrific. Even with the collision and fall, we got up and finished the course - we were one second over qualifying - one point short. But it took both of us the second part of the run to get our wits back....And that was true for our Saturday Open STD run as well - we just weren't there as a team. We got better by the time Ex JWW rolled around, but two handling errors on my part blew the Q.
Sunday was a new day - and we're thankful for it. We had the same crappy weather driving to show grounds and it did this sort of greasy snowfall most of the day. Teller Q'ed (w/ first place) in Novice FAST to finish his NF title. (YAY WOO). In standard Teller blew his a-frame contact - one hit on the way down (see video) but had beautiful layered weaves. And the JWW run was lost on a handler error. The drive home on Sunday was something else. Lots of wet roads and hard pan. Lots of ice and blowing snow. Thankfully we were able to caravan with some other folks and we all made it home safely. It wasn't until we got off the highway in Williston though that I realized how much snow there was on the ground. I arrived home to 32" of snowfall and THANKFULLY a clean driveway and up to my steps. What a relief! It took us several more days to clean out the yard enough to let the dogs out the back door. Murphy was most displeased having to go potty in the driveway.